It includes our commemoration of the places our tūpuna moved through in Te Waipounamu, and the particular mahinga kai resources and practices we used to maintain our ahi kā anchoring our whakapapa to the landscape. Mahinga kai, wāhi tapu and other taonga are of paramount importance, being the cornerstone of the spiritual, historical, cultural, social and economic well-being of Ngāi Tahu. 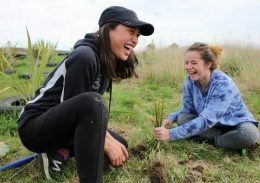 Protecting, enhancing, utilising and maintaining mahinga kai areas, resources and species and the rights of Ngāi Tahu to access these is the basis of the Mahinga Kai Enhancement Fund. To date the Mahinga Kai Enhancement Fund has contributed just over $3.7 million to mahinga kai enhancement related projects including support towards species related projects such as Buff Weka, Kaupapa Kererū and Murihiku Kanakana along with support towards place based projects including Te Nohoaka o Tukiauau/ Sinclair Wetlands, Tūtaetapatu Lagoon- Tūhaitara Coastal Park and Te Waihora. The next funding rounds close 5pm, Friday 30 March 2018. Call 0800 524 8248 today and find out how to apply or download a Mahinga Kai Enhancement Fund application form. For any queries about the Fund, or if you would like application forms posted to you please contact: Helen Thoms on 0800 Kāi Tahu (0800 524 8248) or email [email protected].